I saw in the new year in the Lake District in the company of my wife’s extended family, fully 15 of them. If I were Bernard Manning or Les Dawson I would make a few jokes about my mother-in-law at this point, but the truth is that she’s no monster and my wife’s family is in general rather of a delight. I write this even though none of them read this blog; indeed, if there’s one really serious family failing it’s a general lack of hoot-giving about wine. Perhaps they’re aware of this, as I was asked to put on a wine tasting for the assembled crowd on New Year’s Eve. Of course I accepted, and set about compiling a small spread of themed wines. The theme I chose was syrah/shiraz, hoping that the wines would at least be sufficiently warming to see us through a chilly winter’s evening in the north of England. On the plus side, I thought, there aren’t many more popular red grapes out there. On the down side, anyone who didn’t like syrah/shiraz was in for a crap evening. There were seven wines, three from France, three from Australia and a sparkler from Spain. They weren’t entirely representative, particularly given that some of my favourite syrahs come from New Zealand, but they made for an interesting selection. They were: A 2009 Cave de Tain Crozes-Hermitage, Les 3 Lys, from Sainsbury’s (£7.49); a 2003 Thierry Allemand Cornas from my fridge (worth about £40); La Pamelita, a sparkling shiraz from Spain bought from Theatre of Wine for £15; Jacob’s Creek bog standard shiraz (widely available for around £7.49-£7.99, but often on promotion); Penfold’s Bin 28 Kalimna shiraz 2008 (widely available, about £10-£12) and D’Arenberg Dead Arm shiraz from 1998 (from a friend’s cellar, but also worth about £40). There was also a bottle of Mas Coutelou’s 2010 Vin des Amis (Roberson’s, about £10 by the case when it’s in stock), which has a bit of syrah in it but is mostly grenache. With all the bottles covered in special bags, I asked everyone to choose which single wine they’d like a proper glass of after the tasting, and which they thought was the grenache-based ringer. 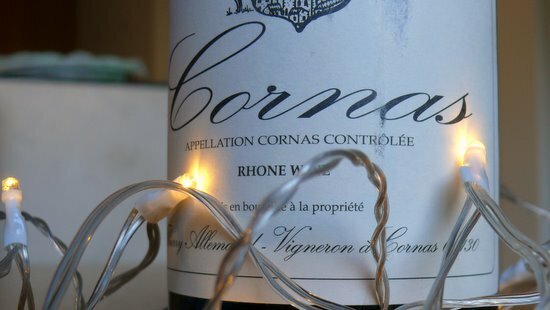 My favourite, and the favourite of my two keenest co-tasters, was the cornas (which, like the d’Arenberg, I had double-decanted a bit earlier, primarily to filter out sediment, of which there was plenty). A super-hot year, 2003 is widely considered one to avoid in much of Europe, and I picked up a case of this from a Justerini & Brooks bin-end sale last year for precisely £20 a bottle. At that price I think it’s a pretty special wine, complex and characterful yet classy in a way that’s not easy to find at this price point. The next keenest family member, though, who I had high hopes for given that he has spent the last couple of years living and working in Italy, asked for a glass of the Jacob’s Creek, which to me stood out as the worst wine by a long distance in an otherwise impressive field (it’s always worth trading up to their reserve range, if you’re going JC). There was one extra test: everyone got a sheet of paper on which I’d printed tasting notes on the seven wines on show (not mine, a professional’s, sourced from the interweb), as well as two rogue tasting notes, one which described a valrhona chocolate bar and the other a coffee from web-based retailers Has Bean. Given that many of the wines were vaguely similar and no one there was an experienced taster, match the tasting notes to the wines was an impossible task, but I asked them to work out which were the two ringers. One, everyone got. The other slipped through the net. I’ve made this very slightly harder for you by deleting the giveaway mentions of “this wine” or “classic northern Rhone syrah” that I kept in for the family, but regular tasting-note readers probably shouldn’t be too long detained. See which two you think are the odd ones out (without using Google, of course). 1) Totally opaque colour with purple crimson hue. Aroma of liquorice allsorts, spice, blackpepper and vanilla with just a hint of marzipan. Flavours of vanilla, plum and liquorice. Long aftertaste of vanilla, plum and spice. 2) Light, aromatic and spicy, with notes of woodsmoke and grilled meat and crisp acidity. 3) High-pitched, very fresh red and dark berry notes, with complicating accents of licorice, violet, rose and magnolia. Full and lush in the mouth, with almost jammy blackberry, cherry cola and cassis flavors. 4) Rich, full taste of yellow fruits such as plum and cherry plum, with acidic notes. 5) The nose shows ripe plum and spicy fruitcake aromas, with hints of currant, chocolate and well-handled cedary oak. The palate is medium bodied in structure, with ripe plum fruit flavours. 7) Buckle your harness, this is going to hurtle you straight through the sound barrier. Its sheer power of all manner of black fruits, integrated dark chocolate and liquorice is beautifully framed. 8) Lovely, stony minerality augmented by a host of flavours that, while still young and primary, are rewarding. Touches of forest fruit coulis, redcurrants, sweet damsons, herbs and a perfumed lift. Utterly delicious, both crunchy and lush. I’ll put the answers in as a comment, so scroll down a bit if you want ’em. * I know only Olly Smith can get away with using words like “shirazamatazz”, and I apologise. This entry was posted in Uncategorized and tagged cave de tain, crozes hermitage, dead arm shiraz, pamelita, sparkling shiraz. Bookmark the permalink. Those answers in full: 1) Dead Arm shiraz 2) Cave de Tain Crozes-Hermitage 3) Allemand Cornas 4) Chocolate 5) Jacob’s Creek 6) La Pamelita 7) Bin 28 8) Vin des Amis 9) Coffee. So four and nine are your odd ones out. Really enjoying the blog. Sad to say I didn’t spot either of the ringers in your description. I obviously need to do some work on my nose. Didnt get the coffee or the chocolate either but then even the Jacobs Creek sounds rather nice! Thanks for trying. I thought that “yellow fruits” and “nectarines” would be the giveaways there – neither of them are often seen in red wine tasting notes. My tasters were confused by the use of the word “crunchy” in No8, which they thought (with some justification, when you think about it) could only be applied to a solid and must therefore refer to the chocolate.